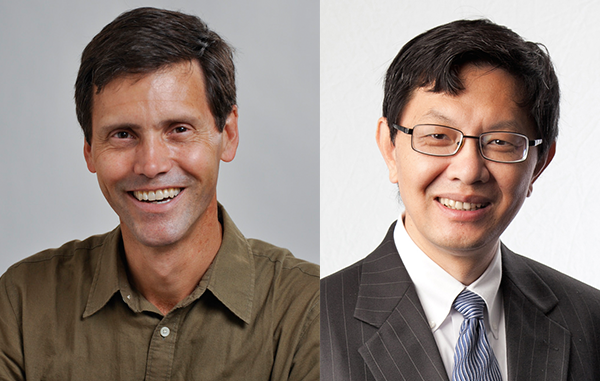 Geosciences faculty members recognized with prestigious award. Two faculty members in the College of Geosciences have been selected to be honored with 2017 Distinguished Achievement Awards from the Association of Former Students. Dr. Christian Brannstrom – professor of Geography, Associate Dean for Academic Affairs, and Director of Environmental Programs – will receive the Distinguished Achievement Award for Teaching. Dr. Ping Yang – professor and department head of Atmospheric Sciences – will recieve the Distinguished Achievement Award for Research. Dr. Brannstrom’s research focuses on social and political aspects of renewable energy and unconventional fossil fuels in Texas and environmental governance in Brazil, where he has conducted field work since 1994. He has supported collaborators working on perceptions of rip currents and pedagogical aspects of his study abroad experiences. His work has been supported by the National Science Foundation and the National Geographic Society. Dr. Yang's research group has been studying cloud properties and forcing on the basis of data sets acquired by the Moderate Resolution Imaging Spectroradiometer (MODIS), the Clouds and the Earth's Radiant Energy System (CERES), the Atmospheric Infrared Sounder (AIRS), and the Cloud-Aerosol Lidar and Infrared Pathfinder Satellite Observation (CALIPSO) instruments. The university-level Distinguished Achievement Awards were first presented in 1955, and have since been awarded to more than 1,000 individuals at Texas A&M who have displayed the highest standards of excellence. The 2017 Distinguished Achievement Awards will be presented during a ceremony at Rudder Theatre at 1:30 p.m. on Monday, April 24.